Pine nuts are the edible seeds of pines (family Pinaceae, genus Pinus). About 20 species of pine produce seeds large enough to be worth harvesting; in other pines the seeds are also edible, but are too small to be of great value as a human food. Pine nuts have been traditionally eaten for a very long time. They are frequently added to meat, fish, salads and vegetable dishes or baked into bread. In Italian they are called pinoli and are an essential component of Italian pesto sauce. 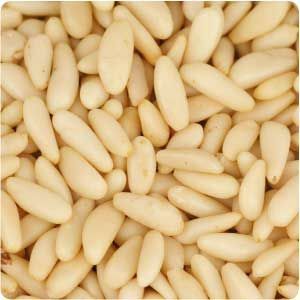 Pine nuts contains 10–34% protein. They are also a source of dietary fiber. When first extracted from the pine cone, they are covered with a hard shell, thin in some species, thick in others. The nutrition is stored in the embryo in the centre. Although a nut in the culinary sense, in the botanical sense pine nuts are seeds; being a gymnosperm, they lack a carpel outside. Pine nuts are rich in Vitamins A and lutein, both of which are known to support sharper vision. They contain heart-friendly monounsaturated fat. Pine nuts build stronger bones, thanks to their Vitamin D content. They boost immunity, because they’re rich in Vitamin C. Pine nuts contain pinoleic acid, which makes you feel fuller faster, and thus aids in weight loss. They are a good source of iron, which is good news for the circulatory and nervous system. The little nut fights free radicals, thus giving Father Time a run for his money. The protein and magnesium in pine nuts makes them an excellent source of energy, so whenever you’re feeling tired, pop a few and feel like new.